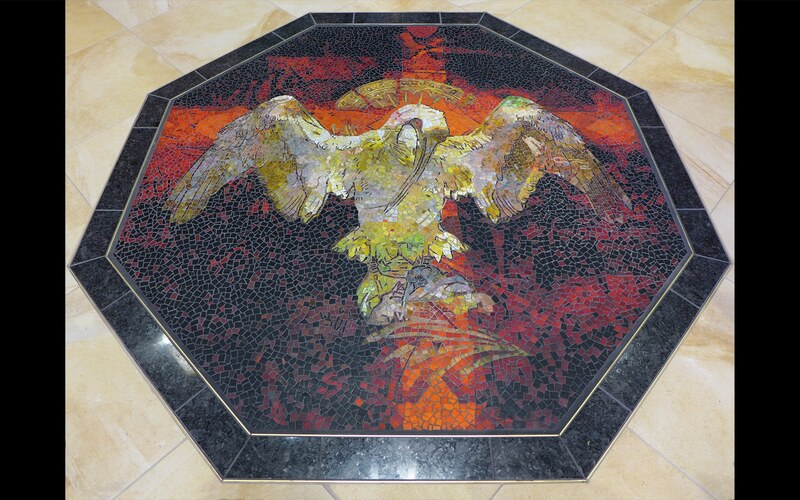 The five sacramental mosaics designed for the people of Holy Spirit Church were inspired in conversations with Father James Morgan. 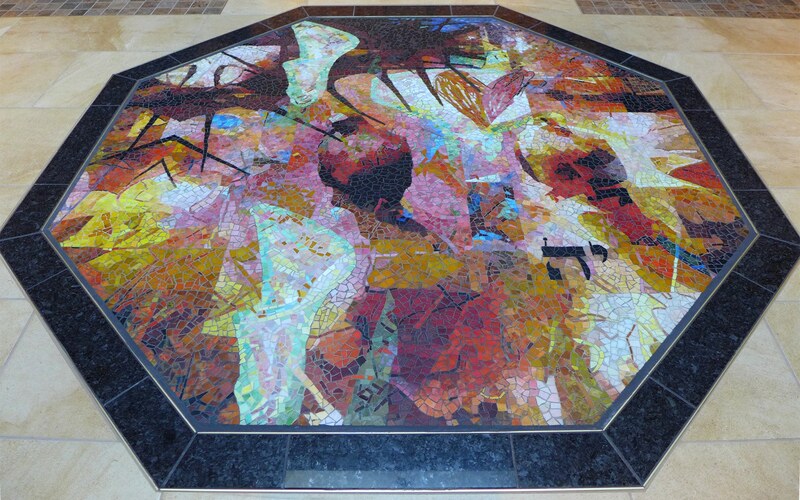 His vision was to give new expression to traditional thematic imagery in a contemporary and meaningful way. An abiding sense of beauty, one that will endure and support the liturgical community for years to come, remained central to our work. 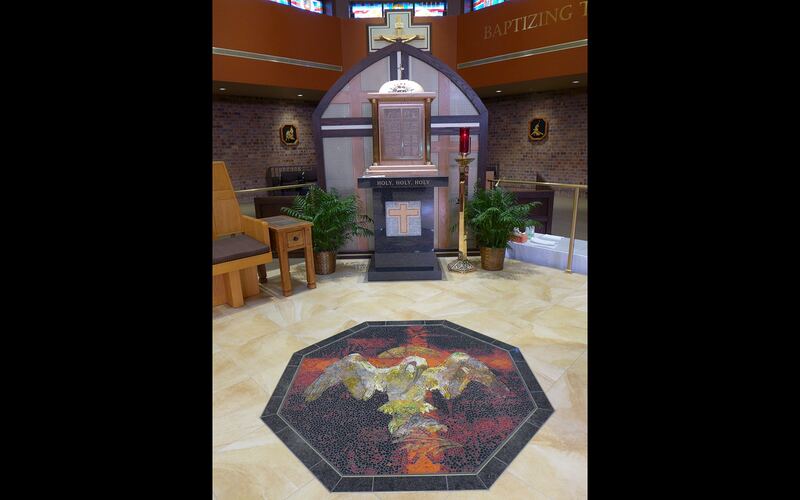 The five themes chosen for the mosaics are the chalice and cross, the lamb, the loaves and fishes, the pelican, and divine mercy. I was inspired to provide an expression of faith that is both intimate and communal for the lives of this faith community by the words of John Paul II’s in his letter to the artists of the world, ”May your many different paths all lead to that infinite Ocean of Beauty where wonder becomes awe, exhilaration, unspeakable joy,” As I write these words during the season of Advent, do know that of course these mosaics constitute passageways in the floors, please walk, or dance, sing, jump, or quietly pass by these mosaics knowing that the One who was born Emmanuel loves you. 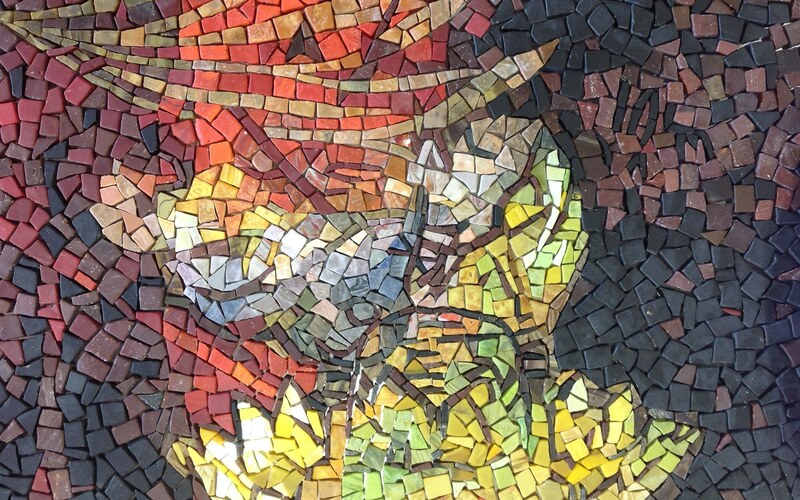 The mosaics were created in Montreal, Canada at the Mosaika Studio. 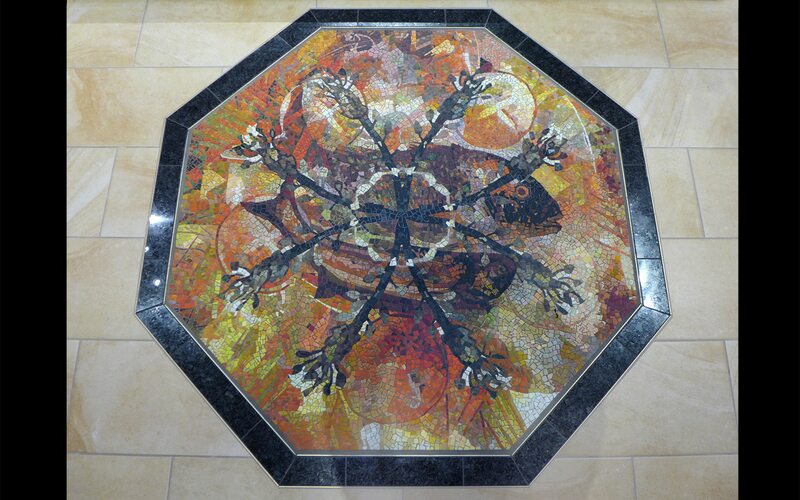 The mosaics are made with traditional tumbled vitreous (glass) smalti. Each piece was individually chosen, cut and shaped by hand with glass cutters, nippers and pliers. This is excruciatingly precise and yet intuitive and responsive work. On a good day, twleve square inched may be completed. On a bad day, one or more previous days work is wiped away and began anew. The Chalice and the Cross, the Crux Immissa, recall the sacrament of the Eucharist. 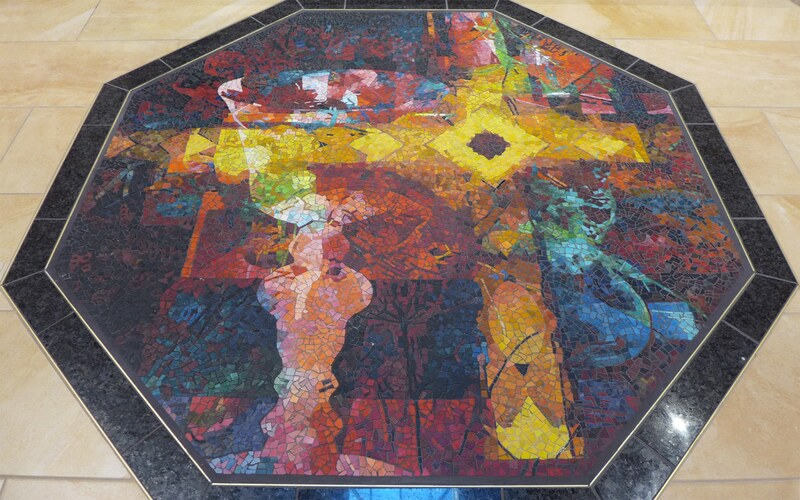 This cross repeats throughout the mosaics. The Lamb is a traditional symbol for the Paschal Lamb and Christ’s followers. 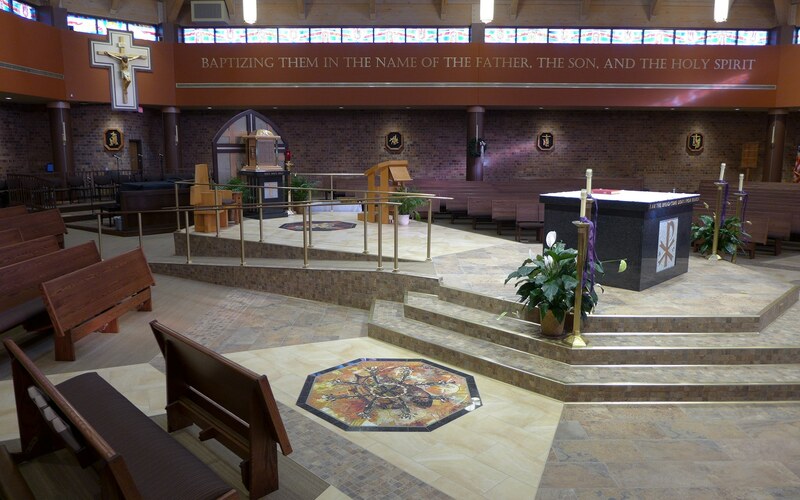 The Loaves and Fishes refer the miracles of Christ and in particular the feeding of the 5,000+. 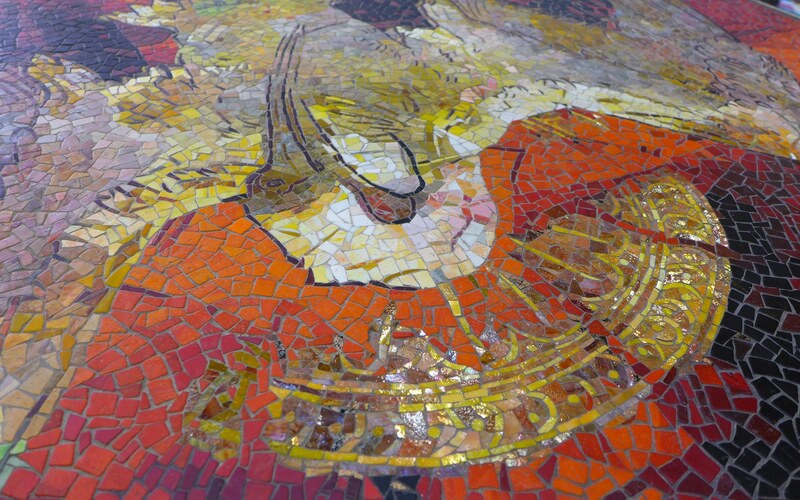 The Pelican is a traditional symbol of atonement in the early Church. The pelican is said to willingly wound herself to feed her young with her own blood. I used lilys (associated with Mary and Easter) for help. The two turtle doves (dedication in the Temple) for enlightenment. The crown of thorns for mercy. The heart (originally drawn by Kena, my daughter, age 4) for the idea of leaving confession with a pure heart of a child, so this is forgiveness. And the Hebrew word YAH, (the unetterable name of God). Most sincerely, many, many thanks to the member of Holy Spirit and the architects at TSP for inviting me to be a part of this wonderful project. I am truly honored.